On Damon Styles’s eighteenth birthday, he is expelled from school. But it’s what happens afterwards that changes everything. Now Damon must come up with a plan. It’s the only way he can think straight. First, get his firearms licence. Then, see if the Pigman will give him a job - pig hunting will teach Damon what he needs to know. And he’d better get a lock for his wardrobe so his mother won’t find what he’s hiding. Damon’s taking matters into his own hands - but so is the town of Strathven. Damon Styles is angry. Angry at his mother for never getting out of bed. Angry at Andrew Parker and Darren Geraghty who antagonise him at school, making pig noises and calling him Damoink. He’s even angry at his friend Moe for the way he laughs. School is no safe haven: Damon is a smart kid who excels at writing, but unless his talents lie in sport, none of his teachers want to know about it. Everyone is determined to see Damon as trouble, and so he is. When he’s finally expelled from school on his eighteenth birthday, Damon just keeps on feeling angry, except now he has a plan – he’s made a list of names, and he’s going to get his firearms license. Then he’s going to work for the Pigman hunting pigs. That way he’ll learn everything he needs to know to make things right. I haven’t been this impressed with a main character in quite some time. Damon isn’t a nice, polite boy. He isn’t the sort of kid you’d expect to find helping little old ladies with their shopping. But he’s not just all rage either. He’s a complicated character, and you can’t help but feel for Damon. Despite the angry outbursts, despite the shell he wears, you can see why he’d feel the way he does. But it’s not just Damon who shines in Pig Boy – all of the characters are fascinating, and work together to build a claustrophobic world that produces a young man like Damon, from his misguided mother to the school principal who’s had enough, and especially the Miro the Pigman who takes the struggling Damon under his wing. 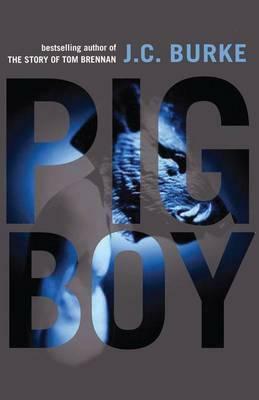 JC Burke has created an absolutely unforgettable cast of characters in Pig Boy, and I have no doubt that this confronting book will appeal to everyone who has ever felt like the world is against them.